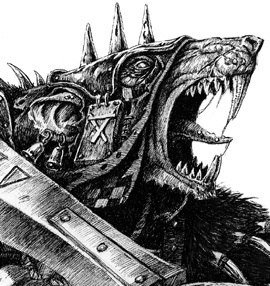 One of the biggest issues facing a Skaven General is whether to include Stormvermin in his army. It is a question I have agonised over for the past three and a half years - since the latest Skaven book came out and never really arrived at what I thought was a definitive answer. Stormvermin Are Attractive Little Buggers, Aren't They? So lets have a look a look at Stormvermin in comparison to Clanrats. Both fill a place in Core and they provide an opportunity to take something other than Slaves (apparently there are other options. I once heard about a guy using Nightrunners. No, I didn't I just made that up). However both Stormvermin and Clanrats count to your Core points whereas Swarms and Giant Rats don't. The table is colour-coded to show where there are advantages and disadvantages. Effectively with Stormvermin you are paying an extra 2.5 points per model to get a +1 increase in Weapon Skill, Strength (Halberds) and Initiative. However you are forgoing the chance to Parry that you get with Clan Rats. In addition the Command option costs and extra 5 points. Under the cold hard light of day, I don't believe that the stat increases are worth the extra 2.5 points over a Clan Rat. My experience is that the extra WS, Str and I very rarely flows through into extra casualties caused. Of course this is dependent on the opposing unit but I haven't witnessed sufficient bang for buck. This is especially true in this world of increased armour....a Str 4 wound is of limited currency. The extra points cost flows directly through to effectiveness in my view by reducing numbers. The jewel in Skaven Special Rules is Strength in Numbers and the extra points per model you have with Clan Rats buys more ranks - and I think that provides more resilience than the stats increases do. "So why would you ever take Stormvermin, Pete?" I hear you ask. Well Clan Rats can't take a Magic Banner while Stormvermin can. This means that if you bulk out Core with Clan Rats over Stormvermin then you only have access to a Magic Banner through the BSB or Plague Monks. PMs cost the same as Stormvermin and come from the Special rather Core slot. In addition they have their own need for a Magic Banner which makes the case of an open slot moot. Therefore the question really becomes "Can you survive on a single Magic Banner carried by the BSB" or do you need access to a second. If the answer is the former then go Clan Rats, if the latter then you have to take Stormies. There are two key banners for Skaven - the Standard of Discipline and the Storm Banner. Ideally you would run both, however I generally think that the Storm Banner is the more critical. The SoD doesn't impact your ranked units but is invaluable - especially on a Bell - for your other units. It is also nice to be able to include the cost of the 50 point Storm Banner in your Core allocation rather than character slot. However more and more I am of the opinion that I can live without the SoD and therefore I am choosing Clan Rats increasingly over the Stormvermin. And that is the problem with Stormvermin. You are paying a premium for a unit with minimal efficiency increases to buy access to a banner. For me that is just not justified in the current meta. Putting Stormvermin with the bell also means that nobody will be getting those points. So its a really good points denial unit also. Yeah, I have found that 3 slave units and the block of vermin works well for point denial. With clanrats you will need 2 units, one for the bell and the other to fill up the 600 points. Giving your opponent potentially a unit of clanrats to kill for more victory points. Although having an extra banner could be nice.